Following on from my earlier post about Greek Heroes , I humbly present Part 2, all about that loveable chap from Salamis, Greater Ajax (or Aias). Ajax (Aias in Greek), son of Telamon was known as either "Ajax the Great" or as "Telamonian Ajax", to differentiate him from Ajax, son of Oileus, who was known as "Ajax the lesser". Which must have been a real ego killer for him! Ajax was a King of Salamis, and as a suitor of Helen, he was called into battle against the Trojans during the epic struggle that was the Trojan War. On the battlefield, he was a brilliant warrior- second only to his cousin, Achilles. Ajax is described as having great strength and bravery, known as "the bulwark of the Achaeans", he went into battle carrying a massive shield as well as an axe or sometimes a spear. 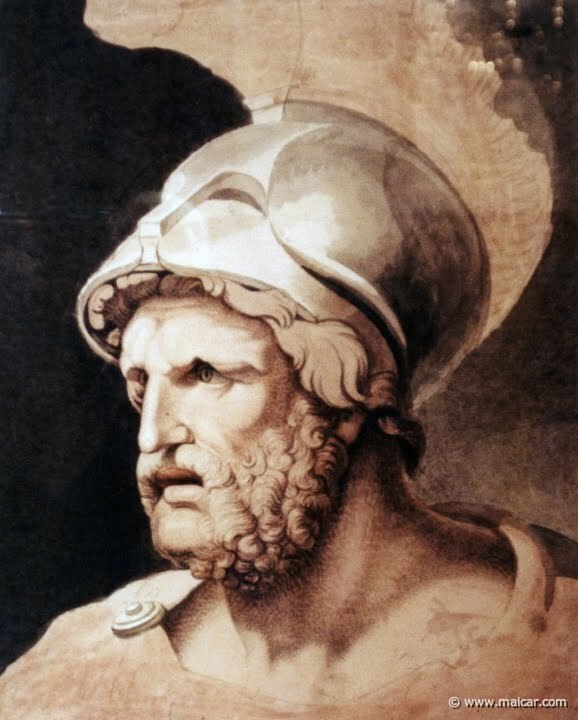 In terms of the heroic poem the Illiad, Ajax is unique because he receives no help from the Gods, which is totally unique among the heroes on either side of the conflict! In that then, Ajax comes to represent hard work and perseverance, of earning the right to have glory. Ajax's great strength is displayed twice in the Illiad while attacking the Trojan Prince, Hector while Achilles was sulking. In Book VII, he gets the better of Hector, wounding him with his spear in a duel. The only thing that saves the prince of Troy was that the heralds called the duel a draw; at the request of the Trojan loving Zeus. Ajax and Hector again battle in Book XIV, when the Trojans make a brutal assault onto the Greek ships. Ajax hurls a massive rock at Hector, gravely wounding him. Apollo revives Hector, who returns to attack the ships again. All the while, Ajax armed with a spear and his massive shield is leaping from ship to ship, holding off the Trojans without any aid. Hector returns and disarms him, but by this stage the destruction of the fleet has been avoided, and Ajax survives without a scratch. As well as fighting Hector, Ajax kills another named 27 Trojans or their allies, in addition to the nameless ones. It is Ajax assisted by Menelaus, who recover the body of Patroclus from the Trojans, who were to feed it to their dogs for Patroclus being a liar (pretending to be Achilles). So, Ajax was a brilliant warrior, second only to Achilles. He was equal to the best of the Trojans (Hector) and was able to defeat many of his enemies in single combat. He also displays eloquence about the true path of the warrior, acting as an embassy to persuade Achilles to rejoin the war. In combat he has no equal, but he is known to be not as cunning as Nestor or Odysseus. Ajax, as with all Greek Heroes is a tragic character. Although he survives the Illiad, he is not to live long into his old age. Upon the death of Achilles, the Greeks have a competition as to who is now the 'Greatest of the Achaeans'. As is was Ajax and Odysseus who are the ones to rescue Achilles' body, they are the two who claim the title and Achilles' armour as their own. In the end, it was Odysseus' eloquent words that won out the other Kings, proclaiming the armour to belong to Odysseus. Now, Ajax in later poems was a character who disregarded the gods. In Ancient Greece, the gods were a force to be appeased at every turn- for example Agamemnon sacrificed his daughter to have fair winds for his fleet's sailing to Troy. Odysseus' odyssey was caused by Poseidon being angry with him. For Ajax then in his hubris to disregard the Gods, he became at their mercy. And it is after the loss of Achilles' armour, that the Gods punish him for his hubris. Upon waking the next morning, Ajax is beset by madness (god inflicted)and attempts to slaughter his comrades, only to be tricked by the gods into slaughtering some nearby cattle. His wits return, and upon seeing what he had done in his madness, he commits suicide. That decision, makes Ajax completely different to other heroes, and helps explain the code by which Greek Heroes (in poems) exist. Ajax, the great warrior displayed his arete through his strength, his courage and his honour on the battlefield. But he became too proud, in his hubris, his pride he dishonoured the gods and as such, was punished. Upon realizing his mistake, the loss of honour was too much for Ajax, it was unbearable, and so he falls upon his own sword, akin to what the Japanese would call seppuku. His body comes from the Immortal Games box, as does the head. 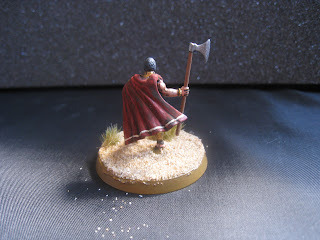 His arms are from a Warlord Games Ancient Briton, his axe head from a Viking, and his cape comes from a Saxon, with a redesign to make it fit. 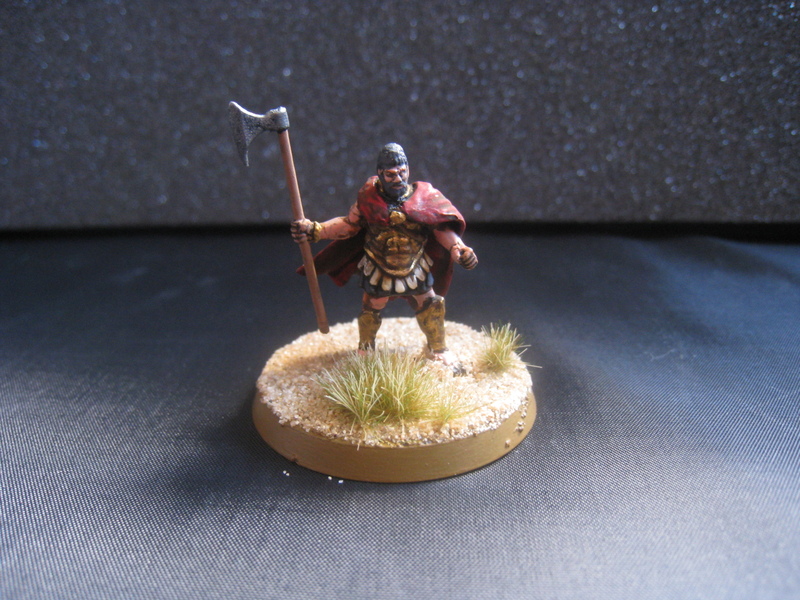 So, I have decided to make more Greek Heroes of the Trojan War, and will write a bit of a biography for them too. Question is, who would you like next? Troilus the Trojan? The idyllic youth of Shakespeare and Chaucer? I could, but he is a dirty Trojan! Great bit of info Chris. I know next to nothing of this period. Fantastic looking model. Very well done.